Is the chosen character revealed before the decision to cancel? Yes. Part of declaring your intention to trigger Arianne is to indicate which character you intend to put into play, which will be revealed (though not leave your hand) when checking the play restrictions for triggering the ability (Step 1 of the initiation sequence RRG page 10). As such, the decision to cancel (in Step 6) is made with full knowledge of which character will actually be put into play by the successful resolution of the ability. Also, when you cancel an ability, you cancel its effects (as opposed to its costs). Since Arianne has no costs, if you cancel her ability, the other character never leaves your hand (it stays there), and since it never enters play, Arianne is not returned to hand. Can I use Arianne to add a duplicate? Yes. Unique Cards, RRG p. 22: "A player may marshal (or put into play by a card ability) additional copies of each unique card he or she owns and controls, placed as a duplicate on that card, for no cost." 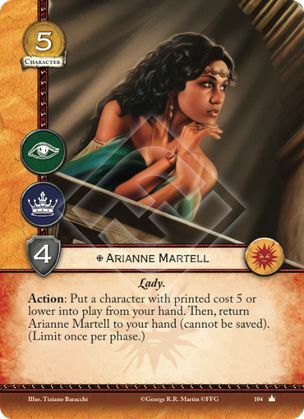 This establishes that using Arianne's "put into play" ability on a copy of a unique card you already have in play will make that copy enter play as a dupe on the first. Duplicates, RRG p. 7: "Marshaling a duplicate is not considered marshaling a card of the duplicate’s printed type. It is only considered 'marshaling a duplicate card.'" This established that when a dupe enters play, a card of the dupes printed type is not considered to have entered play; only a dupe. The Word "Then," RRG p. 21: "If the pre-then aspect of an effect does not successfully resolve in full, the post-then aspect does not attempt to resolve." This establishes that if "Put a character into play..." part of Arianne's ability does not successfully resolve, the "Then, return..." part of her ability does not even attempt to resolve, leaving her in play. Taken together, you CAN dupe a character with Arianne's ability, which does not count as a character entering play, so Arianne is never returned to your hand.